I deeply appreciate the way in which community members from all backgrounds are encouraged to stand confidently in their own identities, while both acknowledging and reaching across differences to embrace the whole of the human community as we work together for justice and peace. 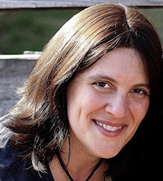 A graduate of Barnard College, and of the Reconstructionist Rabbinical College just outside of Philadelphia, PA, and born and raised in New York, Rabbi Gartner finds Georgetown and Washington, D.C. an invigorating and exciting place to be. Before turning her sights on campus work, Rabbi Gartner was a pulpit rabbi for four years, served as a chaplain for Jewish aging and elderly, and was part of a rabbinic team at New York City’s Conservative synagogue Bnai Jeshurun. She is a member of American Jewish World Service First Rabbinic Delegation and serves on the Board of the Reconstructionist Rabbinical Association. Rabbi Gartner is the co-author of the Moving Tradition’s transdenominational nationally acclaimed, Rosh Hodesh: It’s A Girl Thing Sourcebook. Rabbi Gartner enjoys facilitating meaningful Jewish experiences of all kinds, and accompanying students in the deepening of their inner life, and their connection to Jewish life. She is deeply committed to interfaith dialogue, community-building and service work.